Ordered a 2018 Roam 2, should be here in a week, woohoo! Of interest to Canadian/Australian cyclists looking at the Roam, the 2018 Roam 0 (n/a in the US) has been improved a bit yet again: now has NCX E Air fork -- air spring; hydraulic damping/lockout; aluminum steerer; weight around 1800-1900 grams. Excellent bike (2017) made just a bit nicer. Extremely good value for money. They also took 4 spokes out of the wheels and they are now 28 spoke wheels. The price increased by $200 Aussie dollars over the 2017 model, partly due to the better fork that you mention and partly due to Trek and Specialized utterly dropping the ball with their DS and Crosstrail models for the Australian market. In Australia the highest DS on offer in 2017 is the DS 3(dunno what the 2018 situation will be, probably the same as 2017) and Specialized has as its highest aluminium framed Crosstrail on offer in Australia being the Crosstrail Sport. To add insult to injury for Australian buyers, Specialized has increased the price of the only Crosstrail they offer above the Crosstrail Sport, by $400 Aussie dollars. So now the CrossTrail Elite Carbon is $2,200 Aussie dollars. Tend to agree re. the wheels; 32 f/r would make more sense, and certainly minimum 28/32 f/r. Pricing -- ikr? We are in the same boat here in Canada relative to the US: pricing differentials are not proportionate to exchange differentials. Compounding that some brands (Trek, Specialized) are worse than others (Giant) when it comes to base pricing. D'you have VAT or equivalent included in price? We don't, but the Crosstrail Elite Carbon is right at $2000 Cdn (= 2000 Aud today), + 13% HST. We have a 10% GST/VAT, but the Crosstrail Elite Carbon was $AUD1,800 a few weeks ago, now it is $AUD2,200. As I have stated before, I am not sure that a Carbon frame that comes at a hefty price premium, works well with Mountain Bike inspired hybrids, and with this latest outrageous price hike over an already expensive bike, I honestly would not be surprised if they fail to sell a single one of these bikes in Australia at that price. Between Giant's Roam and Toughroad models, one would have to be mad to buy this Crosstrail Elite Carbon at $AUD2,200. Hi, guys! I am buying my first bike and I am looking between the Giant Cypress DX and Giant Roam 3. I would love to hear your thoughts on the Roam for a totally out of shape, chubby beginner. Some bike shops are pushing me towards the Cypress because of its comfort while others are pushing me towards something like the Giant ATX. I would think that the Roam would kind of be the best of both worlds but no one seems to carry it in stock. Do you guys enjoy it on road as well as on trails? 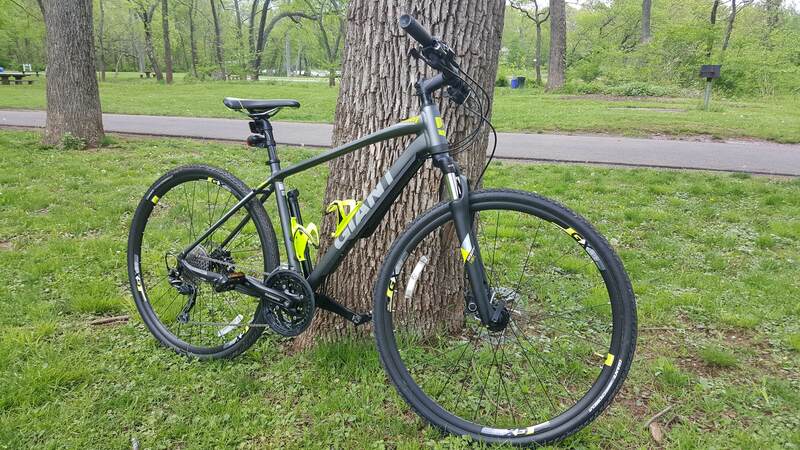 I'm looking for a commuting bike (2.5 miles each way which is nothing) but in the future hopefully as I get used to biking going on 10+ mile long rides on the road. However, I also want to be able to go on just about any trail I want other than an actual mountain biking trail. I would be riding it road more often though. It seems like the Roam has better components than the 2018 ATX and unlike the Cypress has lockout on the suspension fork. @raymour, unless you're biking on TRUE mountain bike trails, pretty much any bike will handle it. I ride my Verve (like a Cypress) and 750 (like an Escape) on hiking trails, some groomed and some not. They handle it just fine, even with tree roots -- you just need to be be careful. One of the biggest factors, in my opinion, is a high volume tire. The more air volume (not pressure) you have, the more forgiving the bike generally will be on mixed surfaces. I think the Roam would suit you well, but you really need to ride one before ordering or buying. What other brands do your local bike shops sell? Every major brand sells a bike like the Roam, and you might find one from another brand that fits you well. Also @raymour, I'll vouch for the Roam. I've taken my Roam 3 on a local single track with plenty of roots, ups, downs, jumps etc. It's a beginners trail for sure but the Roam handles pretty well. The sand defeated me but that's to be expected. The vast majority of my riding is on paved or gravel trails and it's great for that. Very happy I chose this bike. Anyone know where to order a Giant Seek/Roam kickstand? Everywhere I've looked so far, it's out of stock, or international shipping drives the price way up. And disregard that, found it as soon as I posted, of course. I got the Seek/Roam kickstand from my LBS be advised that the bolts that comes with the kickstand might not work with your 2018 Roam they were to big for my 2017 luckily I already had the proper sized M5 bolts laying around. Where did you guys get one from? I need one for my 2018 Roam. Last edited by Bertybert; 08-27-17 at 09:23 PM. I think I ordered the correct one, still waiting for it to get here. One immediate challenge is my posture - I have a lesion in my cervical spinal cord which causes numbness, electric shocks if my neck is in flexion. Ideally I need the handlebars as high a practicable. The question - is there some type of handle bar or mod that would give me the option of a higher handle bar? Last edited by Stat71; 09-03-17 at 05:43 AM. They make adjustable angle stems, or possibly add some headset spacers. You could get a riser handlebar that would give you 40mm more height over a flat handlebar, but I think your Roam may have a 15mm rise in its handlebar, so only a net gain of 25mm there. The biggest increase you could get would be to go with a stem riser and I have attached two different types that would work with your Roam. bought Roam 3 last month. and lost 12 lbs already. the last time I had a bike was like 34 years ago, way back when I was in elementary. we live on the highest part of our city and the block around us is 1.6 miles loop with 11-12% grade for half a mile. have to stop 4 times I think the first time I tried. last Saturday, have to rest just once. long way to go to get fit. Good for you.. Since your just biking around your neighborhood. Try to add a little weight in your bike when things gets boring. buy old water bottles in your thrifty store and fill it with gravel. Hi guys, new here, good Giant Roam chat. I just bought a Roam 2 Disc 2018 a few months back, love it. Just interested to here what sort of upgrades or mods anyone has done with theirs? I'm considering a few things. 1) Getting clipless pedals for it, look forward to that, just ordered from wiggle. 2) Has anyone considered lowering the handlebars? I've only just noticed the Roam has a few spacers under the handle bars to be lowered. I also have a road bike where I've taken some spacers out to give it a more aero dynamic position, however I've never really thought about this for the more mountain bike influenced Roam. Has anyone considered or done this? Will it be sacrificing the comfort unnecessarily? 3) Tyres are probably the only other thing I'd consider upgrading. It seeems pretty good as is to be honest, and I'm still relatively new to cycling so not sure if this is needed. How are the stock Roam tyres rated? I mean they seem fine so far though. I am thinking about getting a Roam 2. It comes with 700 x 38 tires. I'd like a little wider tire. Anyone have any idea of what the widest tire is that could be put on the Roam? Thanks! I recently discovered that the rear dropout spacing on my 2011 Roam-2 is 135mm. I wasn't aware of this and have been running road wheels for about 1,000 miles. Needless to say, I'm going to be buying a set of 700C wheels with 135mm spacing and rim brakes if I can find some. Unfortunately, the original wheels have several spokes that are trashed due to a poorly adjusted rear derailleur limit screw. Took my Roam 2 Disc to Pocahontas State park up in Virginia this last weekend & enjoyed a lot of fantastic MB & forest road trails. The latter were graded gravel & hardpack...super fast & fun rolling hill terrain thru gorgeous fall colors! Needless to say, the Roam was fantastic for this type of riding. AND it was surprisingly competent on the MB trails we tackled! Even did a difficult "black diamond" trail w/ a couple of stream crossings and several gnarly, root/rut filled uphill sections. Of course it's not a real mountain bike, and "proper" off road tires would have been WAY better....but wow, the long, twisty fast downhill runs on the moderate-difficulty level were a blast! VERY handy to have those "useless" forks up front! The GF did very well keeping up on her Specialized Fatboy (she also has a Crosstrail Disc) and we pretty much had the entire park to ourselves after some rain Saturday night scared everybody off. I absolutely recommend this place if you are nearby & want to push the dirt side of our hybrids. Last edited by Roamer2; 10-30-17 at 09:06 AM. Soon will be almost a year with my 2017 Roam 1. Looking to grab some new platform pedals (Shimano Saints perhaps ) and a new saddle for 2018. The road bikes are staying off the salty roads for a while and its perfect to hit the canal paths and do some outdoor winter training. Last edited by Esthetic; 01-04-18 at 11:17 AM.